How Amlodipine and Benazepril works (mode of action)? Amlodipine is used to reduce blood pressure and to prevent chest pain. Amlodipine is calcium antagonist that acts by inhibiting the calcium ion influx thus inhibits formation of calcium- calmodulin complex. Inhibition of calcium-calmodulin complex results inactivation of myosin light chain kinase (MLCK) an important enzyme which catalyses muscle contraction. Overall, Amlodipine inhibits calcium ion influx which results in decreased contraction of arterial smooth muscle cells and vasodilation. Once Vasodilation occurs it causes significant reduction in the blood pressure. 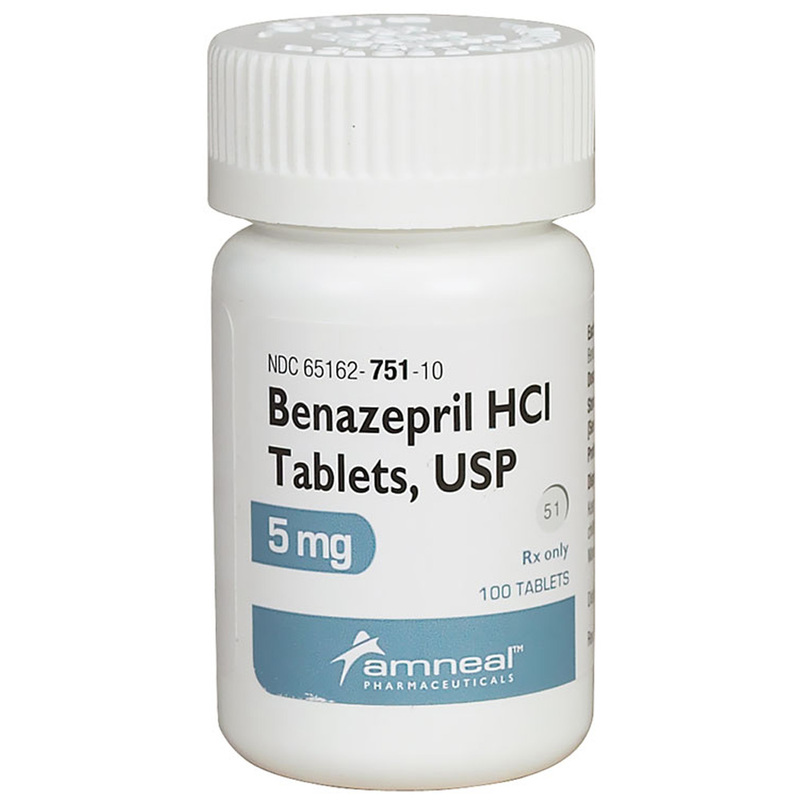 Benazepril belongs to the class of angiotensin-converting enzyme (ACE) inhibitors in human subjects and animals. Angiotensin-converting enzyme is a peptidyl dipeptidase class of enzyme that catalyzes the conversion of angiotensin I to the vasoconstrictor substance, angiotensin II. This Angiotensin II is subsequently activated and stimulates adrenal cortex to secrete aldosterone. Inhibition of ACE by ACE inhibitors results in decreased plasma angiotensin II level. This reduction in ATII level leads to decreased vasopressor activity and aldosterone secretion. Besides this, studies also revealed a direct impact of Benazeprilat on kininase II, an enzyme identical to ACE that degrades the vasodilator bradykinin. Can both Amlodipine and Benazepril be taken together in combination? Yes, Amlodipine is frequently used in combination with Benazepril for the treatment of hypertension (high blood pressure) and to prevent heart attack, stroke and kidney problems. The drugs are available in combination under brand name Lotrel which is a combination of Amlodipine besylate (a calcium channel blocker) and Benazepril hydrochloride (ACE inhibitor). The combination works through relaxing blood vessels, reducing blood pressure and increase supply of blood and oxygen to the heart. The combination drug is available in tablet form for oral administration through mouth. 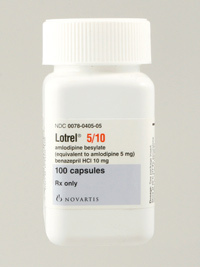 Lotrel capsules are available in 6 different strengths that contains a combination of Amlodipine besylate equivalent to 2.5 mg, 5 mg or 10 mg of Amlodipine, and 10 mg, 20 mg or 40 mg of Benazepril hydrochloride. The strength of Amlodipine and Benazepril combinations are as such 5/10 mg, 5/10 mg, 5/20 mg, 5/40 mg, 10/20 mg and 10/40 mg.
Do not use the Amlodipine : Benazepril alone or in combination if you are allergic to any of the ingredients of Amlodipine or Benazepril. Amlodipine use is contraindicated in patients with hypotension (low blood pressure, aortic and liver disease. Use of Amlodipine is contraindicated with CYP3A4 inhibitors, antihypertensive drugs, other calcium channel blockers, vasodilator agents, antifungal agents , macrolide antibiotics . Avoid high- salt diet and grapefruit products, while taking Amlodipine : Benazepril alone or in combination . Consult with your pharmacist about your medical history as well as any prescription and non-prescription medications or herbal products you are taking. 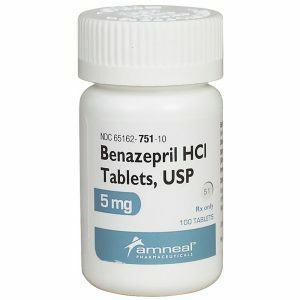 Benazepril may interact with following medical conditions, therefore, it is advisable to tell your doctor or pharmacist if you have any medical conditions. i.e. pregnancy, breast-feeding, heart problems , blood vessel problems, liver problems, diabetes, or kidney problems, autoimmune disease (eg, lupus, scleroderma) etc. It has been observed that Benazepril may interact with some of the medications therefore, it is advisable to discuss with your healthcare provider, if you are taking any medicines. It is advisable not to take Amlodipine or Benazepril alone or in combination with any medication that contains aliskiren (Amturnide, Tekturna, Tekamlo) if you are diabetic. Do not use Amlodipine or Benazepril if you are pregnant. It is advisable to stop medication immediately if you become pregnant. Benazepril act directly on the renin-angiotensin system (RAS) therefore can cause injury and death to the developing fetus.